ROLANG School organizes the summer school on Romanian language between 23rd of July – 3rd of August 2012, in the city of Sibiu in association with the Faculty of Journalism of „Lucian Blaga” University, Sibiu. 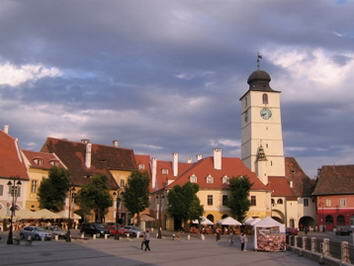 Formerly the center of the Transylvanian Saxons, the old city of Sibiu was ranked as „Europe’s 8th most idyllic place to live” by Forbes and was designated a European Capital of Culture for the year 2007, in tandem with Luxembourg. ( http://en.wikipedia.org/wiki/Sibiu ). The language program includes 30 hours of Romanian language for beginner, intermediate and advanced level. The level of each student will be established according to a placement test given at the beginning of the courses (including a spoken interview). The minimum number of students for each group is 5 with a maximum of 12. The intermediate level (B1 and B2 level) develops skills such as communication about familiar topics, understanding texts with a high frequency in a conversation, writing messages or short compositions describing feelings, emotions and impressions. The language levels are establihed according to the Common European Framework of Reference for Languages. Courses location: Faculty of Journalism, 3 Brutarilor Street, Sibiu (5 minutes walking from the hotel). The course curriculum is adapted to the students, with favorite topics arranged around the student’s interests. The teaching method is based on communication. Conversations and communication activities alternates with comprehension, vocabulary and grammar exercises. The course materials are based on ROLANG manual, „Learn Romanian. Apprenez le Roumain” by Mona Moldoveanu Pologea (manual, exercise book, audio CD). Other video and audio materials will also be used. The instructors are PhD holders, authors of Romanian manuals for foreigners and University of Bucharest teachers. At the end of the course, the students will give a test and will receive a certificate proving their level of Romanian language. Participants will attend visit museums in Sibiu once a week or at will. Participants will attend internationally awarded Romanian film screenings twice a week. The Medieval Festival will be organized in the city of Sighisoara (located at a distance of 91 km from Sibiu), during the weekend 28th-29th of July. The participants are welcome to participate in the trip on Saturday, 28th of July. The fee is of 35 euros and must be payed in the second day of the summer school. The transportation by coach is included. The accommodation will be at the hotel „Împăratul Romanilor”, 4 Nicolae Balcescu Street, in the historical city center. Please visit the hotel’s website for photos: Imparatul Romanilor Hotel – photo gallery . The participants will be accommodated in single rooms. Double rooms will the booked only for couples / families / friends / colleagues willing to share the same room. The accommodation covers 13 nights and includes the breakfast. Check-out: on Saturday, 4th of August, before 12:00 o’clock. If you arrive one day earlier (on Saturday, 21st of July) or leave a day later (on Sunday, 5th of August), you need to pay for the extra night(s). An extra night costs 50 euros / single room and 60 euros / double room. Please inform the organizers about your extra nights and they will book the room on your name. No action on your side is required regarding the accommodation. The deadline for applications is June 15th, 2012.